As students build new fronts against austerity, some older opponents meet campus uproar. E-mail questions, tips or proposals to studentmovement@thenation.com. For earlier dispatches on student and youth organizing, check out the previous post. Edited by James Cersonsky (@cersonsky). After months of pressure from Jobs with Justice, the US Student Association and the Student Labor Action Project, Sallie Mae has quit the American Legislative Exchange Council—the fiftieth corporation to do so. At Sallie Mae’s shareholder meeting in May, more than 150 students and teachers turned out to voice concerns about Sallie Mae’s predatory lending. In partnership with the Responsible Endowments Coalition, Jobs with Justice worked to have several students and activists present a shareholder resolution inside the meeting calling for Sallie Mae to disclose its lobbying practices and end ties with ALEC. Following the shareholder meeting, students and recent graduates from across the country sat down with Sallie Mae’s CEO, Jack Remondi, and demanded Sallie Mae leave ALEC in June. After being denied, students continued to build pressure and collected nearly 15,000 petition signatures before ALEC’s fortieth-anniversary conference. Now with ALEC out of the equation, students will redouble efforts to pressure Sallie Mae to end its predatory practices and provide debt relief for struggling borrowers. Less than six weeks after North Carolina passed the most severe voter suppression laws in the country, right-wing activists gathered in the town of Morrisville for a “Voter Integrity Boot Camp” to continue to battle the alleged specter of rampant voter fraud. Attendees learned all about this nonexistent problem from experts, many of whom were employed by Art Pope–funded think tanks and Heritage Action NC. While the provisions of the law that require all NC voters to have a state-issued ID—state-issued school IDs don’t count—doesn’t take effect until the end of 2014, what will be in effect starting in January is a new provision that allows anyone the ability to challenge another’s vote when they show up at their precinct. In response, students launched the NC Vote Defenders Project, a youth-led effort to train peers to be Precinct Defenders. While plugging into existing efforts, such as the Election Protection hotline, activists will monitor key precincts, give out information about voting rights at the polls and help those who run into trouble advocate for themselves, seek remedy and thoroughly document any incidents. On September 9, more than 100 students, alumni and faculty from the University of Denver rallied against the university’s decision to grant the “Global Service Award” to former president George W. Bush—disregarding 1,600 petition signatures and months of pushback. Created and granted by Dean Christopher Hill of DU’s Josef Korbel School of International Studies, who served under Bush as ambassador to Iraq, the award was originally named the “Improving the Human Condition Award,” a title that sparked outrage among the university’s community and was changed in response. Even after two-thirds of the Korbel faculty signed a letter opposing any award given to Bush and students collected more than twenty nominations for alternative recipients, Dean Hill moved forward. 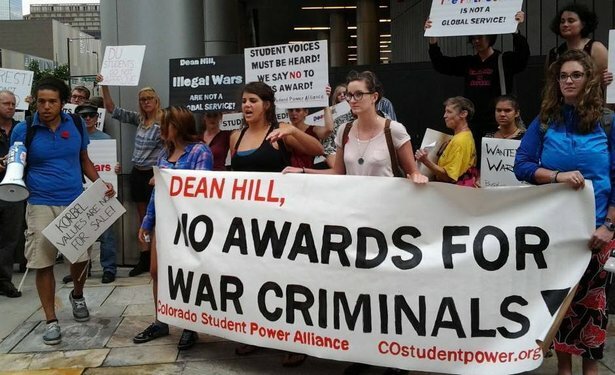 Korbel students and members of the Colorado Student Power Alliance responded by organizing a protest and press conference outside of the award ceremony in Denver. Alumni have also organized a boycott campaign, known as “Not A Dime!” to discourage Korbel graduates from donating to the school until their “Restore Integrity to Korbel” Committee’s platform is adopted. While an evangelical Christian university in Canada cancelled an appearance from Bush in response to campus protest the same week as the DU protest, the DU and Korbel administrations have yet to respond. In response to the militarization of the City University of New York, students, professors and faculty members are organizing actions to protest the renewed presence of the Reserve Officer Training Corps and the hiring of former CIA director and army general David Petraeus to the Macaulay Honors College. The ROTC was ousted from CUNY in 1971; the administration’s decision to invite it back parallels declining economic opportunity among working class students. The ROTC is currently targeting institutions like Medgar Evars, City College, York College and the College of Staten Island—campuses with some of the highest numbers of people of color, who are traditionally targeted to fight in wars and staff military operations throughout the world. Meanwhile, at a protest outside his first class, students chanted “David Death Squad Patreaus, out of CUNY!” By confronting war criminal David Petraeus, students voiced resentment toward his involvement with the illegal wars in Iraq and Afghanistan, which have taken thousands of lives. Students are committed to organizing weekly actions outside Petraeus’s class and protesting the ROTC’s presence at CUNY. Since Janet Napolitano was appointed president of the University of California this summer, students across the state have been organizing for her removal. Students at UC-Irvine and, conditionally, at UC-Berkeley have passed votes of no confidence on the grounds that she has no experience in education and is a threat to the safety of undocumented students. As a leader in education, UC’s decision to hire Napolitano, former secretary of homeland security, is a clear example of the university’s direction: privatization. Through Napolitano’s networks and contacts, UC will now be at the vanguard of developing surveillance technology, drifting further toward private partnerships and away from comprehensive, accessible education. Moreover, as the person charged with the largest deportation program in US history, Napolitano’s appointment creates a hostile environment for undocumented students and their allies. The UAW Local 2865, which represents graduate students in the UC system, demands that the Board of Regents retract this hire and stand with students for access to a safe campus climate. On September 3, students from Long Beach City College took to the streets to protest AB 955, which would allow six California community colleges to increase tuition up to 200 percent for some classes during the summer and winter course periods. More than 600 students have petitioned in opposition to the bill, which is supported by Eloy Oakley, president of the college. If signed by Governor Brown, the bill would create a two-tiered fee system which limits access for students who can’t afford higher costs. The pretext of the bill is that it will provide funding to increase the number of classes during these periods; but with Proposition 30, which increased taxes to create more revenues for education, the volume of classes in the California community colleges has already increased. While putting pressure on the governor to veto the bill, students are planning a protest during the LBCC Board of Trustees meeting on September 24. On September 10, more than 100 students rallied at South Connecticut State University to protest the retention of Professor David Chevan after he sexually harassed a student. In 2011, Wendy Wyler reported this harassment to SCSU, which discouraged her report. SCSU now faces a private lawsuit under Title IX for how it handled the report despite ultimately finding Chevan in violation of its sexual harassment policy. While Chevan has received a minor suspension, the rally and an online petition underscore community outrage over his continued employment. The protests match nationwide activism to enforce Title IX. Swarthmore, the University of North Carolina, Dartmouth and the University of Southern California face Title IX complaints made to the US Department of Education, which is under pressure by #EdActNow to better enforce Title IX. SCSU students will continue to take action until Chevan is removed. StudentBlocNYC, a coalition of student activists from NYC colleges and universities, emerged from an education-focused contingent organizing in solidarity with labor rights groups on May Day 2013. Energized by the free university and citywide convergence on May Day, activists from public and private universities developed a disorientation campaign over the summer, including a citywide disorientation zine and an Agitate! Educate! convergence in Washington Square Park on September 14 to supplement campus-specific campaigns. StudentBlocNYC will continue to create space to coordinate actions, share resources and build both citywide and campus campaigns for New York student activists. Our aim is to critique, unravel and reimagine our college communities; to build solidarity with one another; and to document and discuss dissent, resistance and change. Students across Virginia, from Richmond to Fairfax to Blacksburg, are organizing the first-ever Virginia Student Power Convergence on October 5 and 6 in Charlottesville. Coming out of the National Student Power Convergence this August in Madison, Wisconsin, a group of attendees from Virginia decided to bring the grassroots model to their own state, which ranks fortieth in the nation for state and local appropriations spent on higher education, faces a watershed governor’s race this fall and currently lacks any coordinated student organizing framework. At the convergence, students will hear from longtime Virginia organizers, deepen their organizing skills and strategize across campuses for statewide action. Organizers from other statewide student organizations, including the North Carolina Student Power Union and the Ohio Student Association, will share lessons from their own successful efforts organizing across campuses. Building from the convergence, the burgeoning Virginia Student Power Network plans to organize against the corporatizing forces that are making Virginia education less affordable, accessible, diverse and democratic and to build youth power around issues of social, racial, economic and environmental justice. 10. Who’s Next for Labor? Being at the AFL-CIO convention made it clear to me that our more seasoned peers see what I have seen organizing young workers in Boston: that young workers are a powerful force in the fight for social and economic justice. Between the passage of a young worker resolution recognizing our importance at all levels of the labor movement, a “Hunt for Justice” for young workers, where we stood up for carwash workers while learning about labor history and organizing efforts in Los Angeles, and a special action session, young workers were prominent at the convention. The work ahead is to translate this energy into action. Just as the Dancers Alliance figured out how to organize their young membership, all the young worker groups in the AFL-CIO, from Next Up chapters in different cities to union caucuses like AFSCME’s Next Wave, are working on the same.